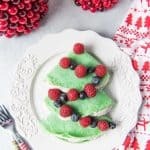 Christmas Tree Crepes with Gingerbread Spice Whipped Cream are simple to make and the perfect way to start your Christmas morning! Make them all month long for a fun & festive way to celebrate the season without a lot of hassle! In a large bowl, whisk together the flour and eggs. It will mostly come together in one large mass. Slowly add the milk and water, about 1/4 cup at a time, whisking thoroughly after each addition to create a smooth batter. If you add too much liquid at once, it will be harder to get rids of lumps and have a smooth, consistent batter, so take your time and keep whisking. Stir in the salt, sugar, butter, vanilla and almond extract. Heat a lightly oiled crêpe pan or medium-size frying pan or griddle over medium-high heat. Using a measuring cup, pour 1/4 cup of batter into the pan and tilt the pan in a circular, swirling motion so that the batter covers the bottom of the pan in a thin, even layer. Cook each crêpe for 1-2 minutes, until the bottom barely starts to brown and the surface of the crêpe goes from glossy to matte, then carefully flip the crepe with a spatula and cook the other side for 1 minute more. Transfer each crêpe to a plate and repeat the process until all the batter has been used up. To make into Christmas trees, drizzle each crêpe with a little Nutella, if desired, then fold in half, then in fourths to make a quarter circle. Layer them in the same direction on a plate, slightly offset and gently lift the top flap of each crêpe, gently spooning some gingerbread spice whipped cream in. Then top with raspberries and blueberries, dust with powdered sugar, if desired, and serve. If making these crêpes like normal, serve hot with nutella, fresh sliced bananas, strawberries, raspberries or blueberries, jams or apple pie filling and sweetened whipped cream. Or whatever other toppings you can think of! In a medium bowl, beat the heavy cream on high speed with a hand mixer until medium peaks begin to form, but do not overmix. Add the powdered sugar, vanilla and almond extract, if using, and the gingerbread spice. Mix again, just until incorporated, then refrigerate until ready to serve. To make a batch of gingerbread spice, combine 2 tablespoons cinnamon, 2 tablespoons ground ginger, 2 teaspoons ground allspice, 1/2 teaspoon nutmeg and 1/4 teaspoon ground cloves in a small bowl. It will keep in an airtight container for up to 1 year and you can sprinkle it on oatmeal, into pancake or waffle batter or in a cup of hot chocolate. If you just want enough gingerbread spice for this recipe, try using 1/2 teaspoon each of cinnamon and ground ginger, 1/4 teaspoon of allspice, a pinch of nutmeg and a smidgen of ground cloves. Supposedly, a dash is 1/8 teaspoon, a pinch is 1/16 teaspoon, and a smidgen is 1/32 teaspoon. Just eyeball it and you will be fine!